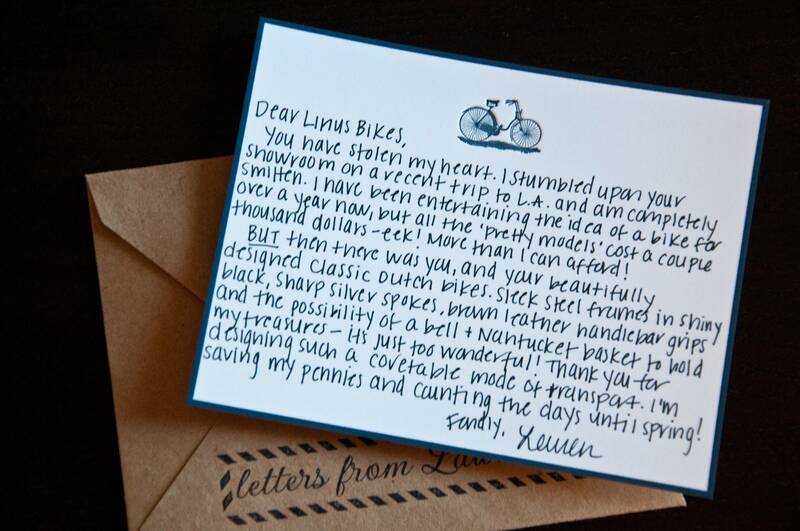 I just discovered Linus Bikes and I’ve already hatched an elaborate savings plan so I can be riding one come spring. Everything about the Dutchi 3 is stunning! And the accessories totally seal the deal: a bell, a basket, a swanky seat! You have stolen my heart. I stumbled upon your showroom on a recent trip to LA and am completely smitten. I have been entertaining the idea of a bike for over a year now, but all the ‘pretty models’ cost a couple thousand dollars—eek! But then there was you and your beautifully designed classic Dutch bikes. Sleek steel frames in shiny black, silver spokes, brown leather handlebar grips and the possibility of a Nantucket basket to hold my treasures—it’s just too much! Thank you for designing such a covetable mode of transport. I’m saving my pennies and counting down the days until spring!